Everybody Knows That the Dog is the Word! The Wave Houndz is a brand new all-ages comic book series by Kerry Kirksmith and Kevin VanHook, with full-color art by Tina Francisco and Mae Hao (whew! Quite a team!). 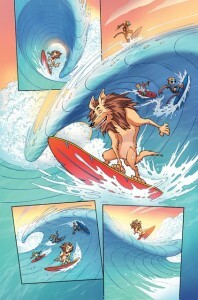 “WaveHoundz are three lovable dogs who live in a world filled with fun and excitement. What makes it all that exciting, you ask? Good Question! Let me tell you!! They can talk! They can surf! They’ve got psychic powers that link them to the kids! And you know what makes them even MORE special? They’ve got a pretty good idea about what’s right and wrong. They stand up for the little guy and make sure that they do their part to keep the beaches, water–and the whole WORLD for that matter– clean and safe.” Oh is that all? Well no, there’s a lot more, as you can see by visiting the official Wave Hounds web site. The “awesome first issue” is out now from Pup Comics (! ).